So I realized yesterday, that my son’s first birthday is approaching really quickly. Time to start planning a party! I ordered some invites yesterday, settled on a theme (nautical) and now I’m going to try and plan a menu. Question, what to serve at a one year olds birthday party?? The color palette I’ve settled on is navy and white with a splash of red (unique I know). I’m sure my little one would be happy with some watermelon and blueberries to fit the theme. I think the guests might be expecting a little more. The fact that I’m gluten free, dairy free, soy free, and nut free makes menu planning for a crowd a bit more challenging. I’m still working out the details (I promise to post the final menu in a few weeks) but I’ve decided one of the sides will be a diary-free cole slaw. 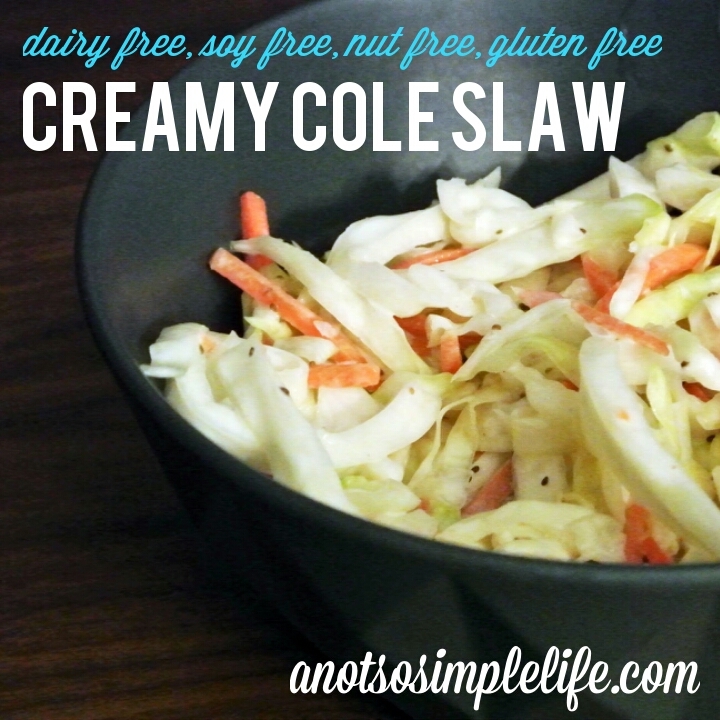 I perfected my recipe for dairy-free cole slaw last summer and it was AMAZING! The problem, I lost the recipe (this happens to me more often than not – hence why I started this blog). After a few tries I think I’ve finally got it. Mix together cabbage and carrots in a large bowl. In a smaller bowl, whisk together all of the other ingredients. Pour over cabbage mixture and stir to coat. Chill for a few minutes, serve and enjoy! I agree that Canola is not good – however, I cannot tolerate soy so it’s the best of two evils for me. You could always sub any type of mayo you want. We recently started using Sir Kensington’s which is made from sunflower oil, the only issue is that it had black pepper which my mom can’t have. When she’s going to be eating with us we use canola oil mayo. If you have any suggestions on other brands I would love to hear them! If you do not object to eggs, which is a big deal to mayo’s traditional intrinsic qualities, but must be dairy and nut free please check out “CHOSEN FOODS” brand 100% avocado oil mayo. Personally, do I rarely do chicken egg and mostly consider them a no-no due to hormones and antibiotics in the food chain, but this product states “organic cage-free” eggs. I can verify through personal use of this product, verification from the company, and my own kinetic testing …two-thumbs up! Makes a darn good creamy dressing/sauce base which seems to match your description requirement requests. Available through Sprouts grocery chain or Vita Cost.com online.